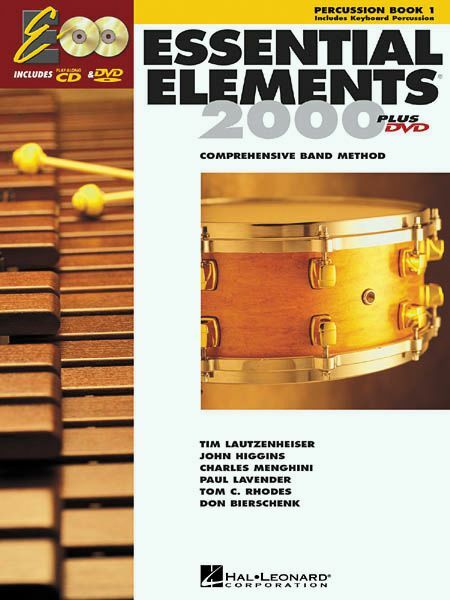 The Hal Leonard Essential Elements 2000 Plus Percussion instruction set includes books that have the same great content as before and CDs which include the same number of audio exercises as previously, but they're now produced on multiformat discs with computer software for practice and assessment assistance. The DVD portion of the percussion instruction disc includes a 15-minute start-up video specific to each instrument as well as all of the book's audio exercises. The DVD-ROM includes tempo adjustment software, SmartMusic Software, Finale NotePad Software, Duets and Trios feature, and a Music Listening Library. Research shows that students are more likely to succeed (and stay in band) if they perform a concert for parents within the first 8 weeks. That's why we've created an impressive early concert in Book 1 featuring 6 full band arrangements that can be performed after learning just 7 notes! The concert is the first of the Performance Spotlight features, which include 12 full band arrangements and 2 solos with piano accompaniment. Book 2 also includes 12 Full Band Arrangements, including a Planned Concert and a Rubank solo. This is an excellent beginning method no matter what age. Get one for your band or orchestra class today!